Yep, you read that right. 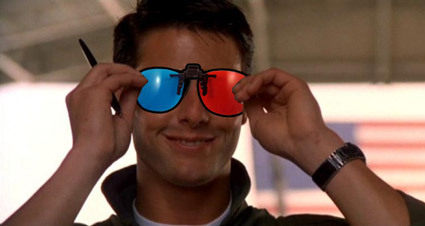 Apparently a company called Legend3D is re-releasing Top Gun in 3D. The company takes classic movies, updates them into 3D, and then shares in the revenue that the film makes. What's the Bro Council take on this? 3D is pretty lame in movies, but Top Gun is one of the best movies of all time (and it stars a pre-crazy Tom Cruise) so the glory of hearing Kenny Loggins belt out Danger Zone on the big screen outweighs the crappy 3D effects we're bound to see. Bro Council, Approved. Bonus: Click the "Read More" link to see a picture of Kelly McGillis then and now.